Vice President Yemi Osinbajo yesterday commissioned the N15billion Jubilee Syringe company in Onna local government area of Akwa Ibom State, saying the factory will improve the health care delivery of Nigerians. He also stated federal government’s readiness to partner the government of Akwa Ibom State in its quest to improve the health care delivery of Nigerians through the establishment of the world class syringe factory in the state. According to him, the federal government will support the state in ensuring that the over 400 capacity of the factory are increased to one million. Jubilee Syringe Manufacturing Company is N15billion ($35million) syringe manufacturing company which sits on a 40,000-square meter (sqm) land area in Onna local government of Akwa Ibom State. The estimated 350 to 400 million syringes production per annum far overshoots that of a company in South Africa which has a production capacity of 93 million, thereby making Jubilee Syringe the largest syringe manufacturing company on the entire African continent. The global disposable syringe market is expected to reach $7.5billion (N2.6trillion) in 2022, according to Transparency Market Research, just as disposable syringes are the most consumed medical devices in the world. An estimated 39 billion units were sold in 2013, with market value of approximately $4.93billion. The disposable syringes market has been segmented into two major types: safety syringes and conventional syringes. With projected annual earnings of about $15million (N5.5billion), Jubilee Syringe Manufacturing Company hopes to initially take 500 Nigerian youths off the congested labour market, with further commitment to grow the numbers. Osinbajo also commissioned a renovated General Hospital at Etinan local government area of the state as part of activities to mark the 30 years of creation of the state. At the commissioning of the reconstructed General Hospital Etinan, the vice president described the secondary healthcare facility as an extremely useful project as it touches the lives of people directly. “This is what makes governance worthwhile. I am glad to know you are doing it across the state in eight other locations. I congratulate the people of these communities and I pray the almighty God enable you to complete all you have set your heart to do for the benefit of the people of the state and the Nigerian people. Flanked by his Gombe, Delta and Taraba counterparts, the state governor, Udom Emmanuel, said the reconstructed hospital is one of the grassroot projects to launch a new phase of secondary health care services in 10 federal constituencies across the state. He said, “People die from a mere fall which this could have handled. Your Excellency, this was built with 21st century state-of-the-art equipment from the US. 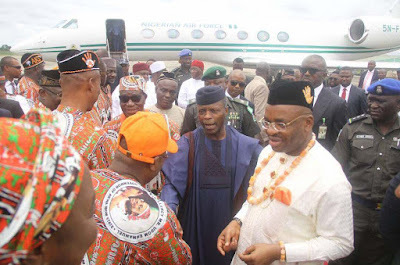 “The life of every Akwa Ibom person is as important as the life of the governor. Here, pregnant women and children under five are treated free. We are re-launching secondary healthcare of international standards in federal constituencies across the state. We are taking healthcare back to the grassroots”, he said. Meanwhile over 2,445 Akwa Ibom indigenes have benefited from N125 million Micro Small and Medium Enterprises (MSME) of the federal government. Vice President Osinbajo disclosed this at the Nationwide MSME Clinics for viable enterprises, Akwa Ibom Edition in Uyo yesterday. Osinbajo said, “About 2,445 Akwa Ibom people have benefitted from the programme across 62 associations in the state”.